Delaware River Rock – comes in five sizes ( 3/8″, 3/4″, 1″, 1-3″, 3-8″). This is a smooth decorative stone, ranging from blues, grays, and purple in color. 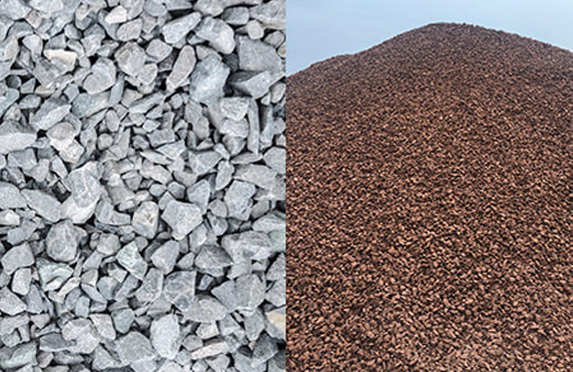 Red Stone – This is decorative gravel that is a red chipped stone. It comes in both 3/8” and ¾” sizes. Salmon Stone – This is a decorative stone that is smooth in texture. It comes in 3 sizes (3/8”, ¾” 2-4”). This ranges from white to beige in color. It is also known as beach stone or sea shore stone. 2A Modified – Used for base under patio. It is industry standard that you use a minimum of four inches of stone compacted every two inches for residential patios and walkways. For driveways it is recommended that in a freeze thaw area you use at least 10-12 inches for your base compacting every two inches. For more information on industry standards, visit www.icpi.org. 2B “Clean” Stone – This is a ¾” clean stone. It is used for driveway applications, shed bases, and drainage stones. This is the proper stone to be used in a French Drain. 1-B “Clean” Stone – This is a 3/8″ clean stone. It is less expensive than decorative stone and can be used under decks, in driveways and walkways. 4” Ballist Rock – This is also known as tire scrubbers. It is best used for storm drains. Screenings – This is used as a leveling course for natural stone and manufactured flagstone. It is recommended that you use 1” for your leveling course. Concrete Sand – This is used as leveling for pavers. It is recommended that you use 1” for your leveling course. Bar Sand – This is used for sand boxes and underneath vinyl swimming pools. It is beige/tan in color. Q: How is stone sold? A: We sell stone by the ton as well as our screenings, concrete sand, and bar sand.